Viscosity: from 0,1 up to 10.000 mPas. Metering capacity: from 0,001 up to 10.000 l/h per head. Temperature range: from 0 up to 300°C. Outlet pressure: up to 1.200 bar. Metering accuracy: less than 1%. 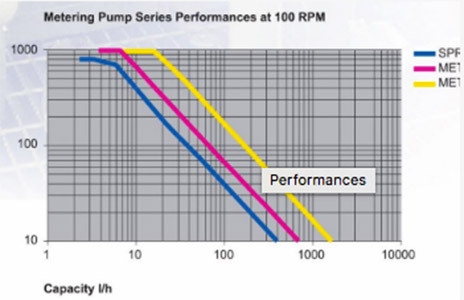 The performances of the different models are shown in the diagram.